Passion for the sky is forever!!! The Watch Factory ‘“Raketa”, which means “rocket” in Russian, took its name in honour of the Russian pilot and cosmonaut Yuri Gagarin’s first flight into space in 1961. Inspired by the sky, our watchmakers produce watches for Russian pilots of the leading Russian aviation companies: “Sukhoi”, “Tupolev”, “Ilyshin”. 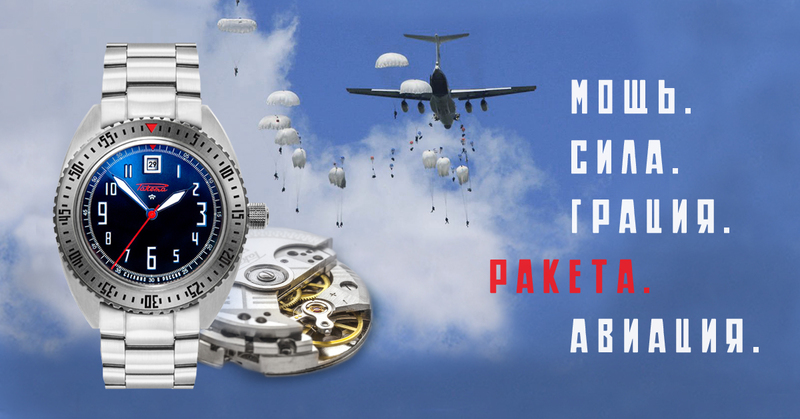 If you dream of flying, you can reach the sky without specialized training — Russian watches “Raketa” and “Pobeda” are for you! We congratulate you with the Day of the Russian Air Force (VVS) and the Russian Airborne Forces (VDV)! With the help of the leading Russian aviation companies we created our ideal watches for Russian pilots: Raketa “Pilot Tu-160” is the result of the collaboration with Tupolev engineers. Raketa “Sukhoi” watch model for pilots of the attack aircraft Su-25.